Ottomans are one of the most useful pieces of furniture in a living room, functioning as both a foot rest and a separate chair or gaming table. 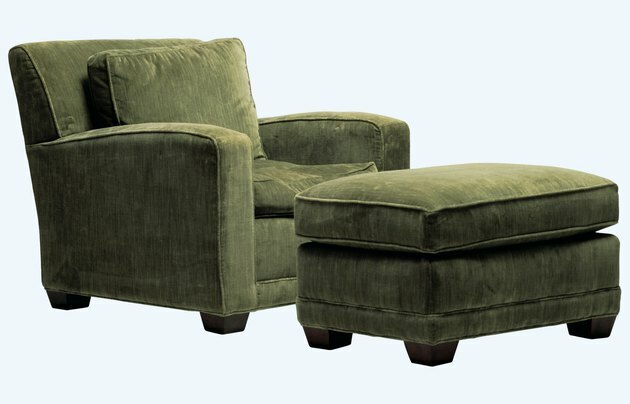 An easy way to add yet another functionality to a beloved ottoman's resume is to convert it into a convenient storage area. Ottoman storage is the perfect place to keep games, blankets or children's toys. Great for last minute clean-ups as well, nearly any ottoman can quickly and easily be converted to storage with basic tools and a set of hinges. Since cutting of the upholstery is required, it is best to do this project with an older ottoman. Old ottomans make great blanket storage solutions. Cut the top cushion of the ottoman off using the utility knife and passing the blade around the outside of the ottoman, as deeply within the crease as possible. Cut just below the top cushion seam if the ottoman's top cushion is not separated by a deep seam. Remove the top cushion completely, cutting through any straps or additional fasteners, and set it aside. Clear out access to the base of the ottoman from the top by removing any material covering the top of the lower portion of the ottoman. Cut off this material with the utility knife or remove any screws or nails holding down a more solid piece of material such as wood. Drill a hole into the wood surface if there is no other option, then use a saw or a hacksaw to cut out the entire top access. Sand the edges of such a cut if necessary. Clean out the interior of the ottoman to make it presentable for storage. Fasten the 1/8-inch plywood board to the bottom of the ottoman if it does not already contain a bottom by turning the ottoman upside down, placing the plywood on top of it and attaching it with wood screws. Space the wood screws evenly every 12 inches around the perimeter of the ottoman. Attach both sets of hinges to the underside of the ottoman lid, with their pivoting hinge just along the edge of the ottoman. Hold the lid where it would attach to the ottoman in an upright position, and have an assistant screw the other half of the hinges into the ottoman wall. Test the hinge motion to ensure that it is accurate, adjusting the position as needed for a smooth and even operation.